V160: Progress on My 18th c. Pocket...and Then More Pockets! I've been embroidering on and off since early May, on my first Georgian pocket. I originally used a pattern from Costume Close-Up: Clothing Construction and Pattern, 1750-1790 , but decided not to follow the color scheme of the original in the Colonial Williamsburg collection. Here is my progress so far! I'm not much of an embroiderer, but I'm determined to get this done. It is the first time I've use long-and-short filler stitches, and I'm really liking the effect. Scottish, early to mid 18th c. Don't you just adore the animals? mid-18th c. Charming pair with a different design that we normally see. All-over embroidery and contrasting binding and tape, very beautiful! These are just a couple of the embroidered pockets, but they also have categories for woven, printed, patchwork, undecorated, quilted, and knitted pockets. I never knew there were so many variations! Gorgeous! The embroidery looks great! I'm always a little daunted by long and short stitches. 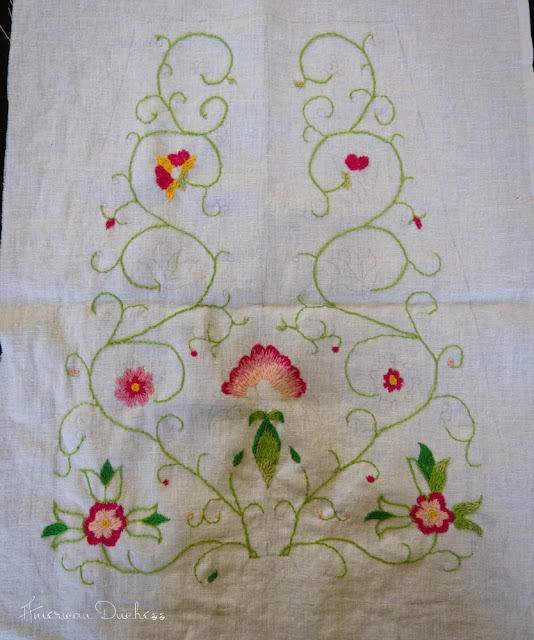 Beautiful embroidery, sad that it will be hidden under a skirt. I just started my own pair of pockets. I'm trying to copy the strawberry pockets from the met, the ones with the crazy all over the place vine embroidery and the cheerful yellow bias tape. I have the pattern drawn out but haven't started embroidering yet. I like the inspiration pictures too, I had not seen any of those ones. That last pair is so interesting! I might try that next time I make pockets. Thank you for sharing that great resource, it is so helpful!! Hope you have fun at your event! For any one who lives nearby... quite a few years ago, I saw quite a number of lovely pockets at the West Chester Historical Society. At that time the collection was resident in a lovely home originally built in the 1600s. I assume that all the clothing and textiles have been moved to the museum in town now. Also, can't help but share a story told by my great grandmother Penelope True, circa 1870 in her diary. She was the "school teacher" at a nearby town and, on a visit home road double on a horse with her cousin who came to get her. Over the course of the trip she, much to her distress, lost everything out of her pockets (money, little presents to family, etc.) as they jounced along, but didn't discover it until she reached home. Her pockets were essentially the same as the ones pictured here with the slit opening. What a wonderful story! I BET she was distressed!